Before the treaties and Federal Indian Policy, there was a period when only missionaries were attempting to educate Native Americans. Beginning with the Jesuit mission school for Florida Indians in 1568, formal education of Indians was dominated by the church for almost 300 years (Special Subcommittee on Indian Education, 1969, p. 10). The goal of the missionaries was not so much to educate the Indian as to change him. Jesuits and Franciscans were the first missionaries to attempt to mold the Indian into a white man, and when Protestants gained a foothold on the northeast coast, they vigorously attempted to Christianize the Indian. Education was perceived as the best means to accomplish this goal, so in 1617, King James I requested funds to educate children of these Barbarians in Virginia (p. 10). King James Is request eventually resulted in the establishment of the College of William and Mary. Other schools for Indians were started, but none were successful in civilizing the Indian. Although Indians understood the concept of Christianity and learned to read and write, they immediately relapsed into infidelity and barbarism upon returning to their tribe (Special Subcommittee on Indian Education, 1969). Prior to the arrival of the Europeans, all Native American tribes were autonomous from each other. They conducted their own affairs and depended upon no other source of power to uphold their acts of government (Canby, 1988). The colonies and Native American tribes were often equal in military strength. Therefore, the early colonial governments viewed the tribes as sovereign nations and treated them as such. In order to gain title to Indian land, colonial governments primarily used treaties. The Supreme Court has expressly held that an Indian treaty is not a grant of rights to the Indians, but a grant of rights from them (Pevar, 2002, p. 48). Following the War of Independence, the young United States made treaties with hundreds of indigenous tribal nations, exchanging lands for payments and access rights (Canby, 1988). The signing of the treaty between the United States and the Delaware Tribe in 1778 established treaties as the primary legal basis for Federal policies in regard to the American Indian (Special Subcommittee on Indian Education, 1969, p. 11). What the government pledged in the treaties is still at the heart of much controversy today. Because of an oral culture the Indians believed in, the word was to be inviolable, sacred, meant to last forever. Conversely, most Americans viewed treaties as documents only good until the next one was written. Reservations emerged as a result of the treaties. The first Indian reservation was created in 1651 (Borio, 1995). Once proud self-sufficient independent people, Native Americans became totally dependent on the United States federal government for their very survival. Signing treaties meant giving up huge tracts of land. During this time period, Native Americans found their land base diminished, their hereditary chiefs gone, and their lives controlled by an external governance system (North Dakota Department of Public Instruction, 1977). Because signing treaties meant giving up land, most tribes did not want to sign treaties. Chief Ouray of the Ute tribe put it this way: Agreements that Indians make with the government are like the agreement a buffalo makes with the hunter after it has been pierced by many arrows. All it can do is lie down and give in (Hill, 1994, p. 34). Once tribal nations were defeated and placed on reservations, some people would argue they developed an unhealthy dependence on the federal government for subsistence, housing, and all legal affairs. This dependence, along with the difficulty of assimilating into the white society by accepting the white mans values and culture, soon led to extreme poverty and hopelessness on most Indian reservations. Faced with staggering poverty and the loss of their traditional ways to obtain subsistence, many Native Americans developed a victim mentality. This victim mentality continued with the federal governments view that given their own piece of land, Native Americans would become farmers and therefore end their dependence on the federal Indian government. However, the governments intentions of giving individual Indians their own land was not based solely on assisting them to assimilate into mainstream society. It was also motivated by greed for land and guided by the misconception that Native Americans would be better off if they were forced to assimilate into mainstream society. In 1881, Senator Henry M. Teller said, The real aim of [the Dawes Act] is to get at the Indians land and open it up for resettlement (Ethnic Cleansing, n.d., para. 1). The Dawes Act was another attempt to assimilate Native Americans and protect their welfare, but due to past failed relocation efforts, Native Americans were suspicious of its intent. The Act required Native Americans to anglicize their names. Rolling Thunder thus became Ron Thomas and so forth (Ethnic Cleasing, n.d., para. 4). However, some government agents administering the Act managed to slip the names of their relatives and friends onto the Dawes Rolls and thus reap millions of acres of land for their friends and cronys [sic] (para. 4). The Meriam Report of 1928 found in one state alone Indian-held land totaled 138 million acres in 1887, at the time the Dawes Act was signed into law. This had been reduced to 47 million acres of land by 1934 when the Act was repealed. The abuses of the Dawes Act were revealed and set forth in the Miriam [sic] Report of 1928 (para. 5). A decade before the passage of the Dawes Act, the U.S. government had enacted a policy where Native American children were taken away from their parents and placed in boarding schools (Adams, 1995). There were two different models of boarding schools, on-the-reservation boarding schools and off-the-reservation boarding schools, often hundreds, even thousands, of miles away from the reservation (Adams, 1995). In the 1880s, the government agreed that the only way to educate Indian children was to take them away from their homes, forcibly if necessary, for at least four years. 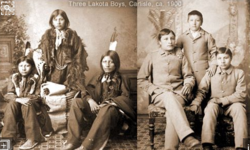 Therefore, the purpose of federal government boarding schools was to remove Native Americans from their homes and cultures in order to change their identities and lifestyles, to be like the European-American or the white man (Cherokee Indian Boarding, n.d.). "The reservation day school was the first part of this venture into Indian education. The children lived in the village with their families and attended school nearby during the day" (Keohane, n.d., para. 16). Attendance at these mission schools was made mandatory by regulation on many reservations for all native children aged six through sixteen (Jaimes, 1992, p. 380). However, it did not take too long to realize that day schools could not make an Indian child white. The children were too close to their homes, families and cultures to be fully and successfully indoctrinated with white societys language and values (Keohane, n.d., para. 20). Therefore, the next step was to establish reservation boarding schools that were located near the agency headquarters (Keohane, n.d., para. 21). Although these schools were located on the reservation, the children were only allowed to go home during the summer months and at Christmas. "One of the reasons was . . . that parents often came to visit their children, thus allowing the children the opportunity to speak their language and stay in contact with their tribal ways" (Keohane, n.d., para. 21). Government officials who wanted to suppress Native American culture viewed these visits as counterproductive (Meriam et al., 1928). The third and most destructive plan was to send Native American children to off-reservation boarding schools. This final plan did work by preventing Native American children to hold on to their language and culture. Actually, what started as an experiment with Indian prisoners became the model upon which boarding schools were patterned after. In 1875, Lt. Richard Henry Pratt arrived in St. Augustine, Florida, with Indian prisoners to whom he began to teach the white mans beliefs. Eventually, Pratt was permitted to take his students to an unused military barrack in Carlisle, Pennsylvania. Thus began the most significant residential Indian schools (Keohane, n.d.). Using Lieutenant Pratts experiment as a model, Indian children were sent, in many cases, hundreds of miles away from family, language, and Native American ways. Upon arriving at their school, the students were required to have their hair cut short, an act that produced much resentment among the Indian children. School uniforms replaced tribal dress, and each was given a "white man's" name. No effort was spared when it came to breaking the Native cultural ties (Adams, 1995). During the 1920s, investigations of Indian boarding schools found inhumane conditions  poor diets, hard labor for children, military conditions, high mortality rates, overcrowded conditions, and the spreading of numerous diseases. Eventually, changes in Indian education, due to this discovery, included an end to the traditional boarding schools and a reintroduction to Indian history and culture, as slight as it was. However, to this day, the boarding school era has left its scars on Native American people (Trennert, 1998). Adams, D. W. (1995). Education for extinction: American Indians and the boarding school experience, 1875-1928. Lawrence: University of Kansas Press. Canby, W. C., Jr. (1988). American Indian law in a nutshell (2nd ed.). St. Paul, MN: West Publishing Co.
Hill, N. W. (1994). Words of power  Voices from Indian America. Golden, CO: Fulcrum Publishing. Jaimes, M. A. (Ed.). (1992). The state of native America  Genocide, colonization, and resistance. Boston: South End Press. Meriam, L., Brown, R. A., Cloud, H. R., Dale, E. E., Duke, E., Edwards, H. R., McKenzie, F. A., Mark, M. L., Ryan, W. C., Jr., & Spillman, W. J. (1928). The problem of Indian administration. Baltimore: Johns Hopkins Press. North Dakota Department of Public Instruction. (1977). The history and culture of the Mni Wakan Oyate (Spirit Lake Nation). Bismarck: Author. Pevar, S. L. (2002). The rights of Indians and tribes: The authoritative ACLU guide to Indian and tribal rights (3rd ed.). Carbondale and Edwardsville: Southern Illinois University Press. Special Subcommittee on Indian Education. (1969). Indian education: A national tragedy  A national challenge (Report No. 91-501). Washington, DC: U.S. Government Printing Office. Trennert, R. A., Jr. (1998). The Phoenix Indian School: Forced assimilation in Arizona, 1891-1935. Norman: University of Oklahoma Press. This page contains a single entry by Dr. Erich Longie published on August 1, 2017 5:45 PM. Fear is the greatest enemy of perseverance: Video games and Dakota culture was the previous entry in this blog. Native American History: The Mission Period, Treaties, and Reservations By: Dr. Erich Longie is the next entry in this blog.